When I opened my eyes after my daughter wrecked our car in March, one of my very first thoughts as I struggled to catch my breath and orient to the situation at hand was, “Seven more days. In seven more days, I will feel better (than I do now).” Every seven days for the next couple of months, I moved the bar, trying to give my sidelined self something to reach for, to hope for, and to push back the depression that not being able to exercise brought on. The more weeks that passed, the further out the goal became, mostly out of necessity. Though my physical progress felt incremental, it was at least fairly steady; I was regaining some strength, some flexibility, some balance, even if the pain had not fully subsided. Still, after seventy days of twice a week physical therapy and copious workouts on my own, the sure knowledge I had (I think I’m a little too in tune with my body sometimes) that the surgery had failed to repair my bum knee made mental progress difficult. Truly, I felt that for all the improvements I could see, it was all for naught if the meniscus was compromised. On July thirteenth, nearly four months after the wreck, I received MRI confirmation that my meniscus was still torn, that the first surgery had failed, as I suspected, and I cried. A lot. “Why me?” pou t, pout. “Surgery…again (3rd in a year),” sniff, sniff. “Fine, cut me open again, if it means I can get back on the road!” I was so tired of waiting, tired of sitting life out, and tired of being less active than I was accustomed to being. Nevertheless, in my mind, I started the “X-more-days” thing all over again. And for two weeks after that visit in July, I focused on my surgery day, August eleventh, and went to the gym on a near daily basis, trying to rebuild my atrophied muscles in preparation for more bench time. My head was and has been wrapped around the belief, the Grand Idea, that surgery will make everything “all better.” I’ll be made whole again by my surgeon’s tools. Right? Well, a funny thing happened at the gym Saturday before last: I started thinking. It got even more funny when I went for a walk that evening because I thought some more. Shortly thereafter, a sentence popped into my head: “ I don’t have to do this.” At that point, I stopped thinking and began reasoning, pondering this idea of surgery as a panacea to my knee problems (of the moment). When I reasoned still more and allowed myself to entertain an option for living that didn’t include surgery right now, this wonderful, spiritually enlightening thing occurred. I ceased worrying so much about surgery, even about being made “whole” (as if at 44 with knees that have bothered me in one way or another since my teen years, my knees have ever been perfect! ), and began to concern myself with what I could do now, despite the meniscus tear. After all, I have been getting stronger, walking more, doing more. Despite the pain and the limitations I have in that knee, I am improving. That lightning bolt of wisdom and the peace that ensued was exactly what I needed to shift my paradigm away from an injury mindset to one of contentment and clarity. It was truly, unmistakably a God send that put my mind at ease for the first time in months; and I couldn’t be more grateful or feel more blessed for it. Come Monday morning, it took all I had not to just call my surgeon’s office and cancel the upcoming surgery without discussion, but I controlled myself and made an appointment with him instead. In preparation for our visit later in the week, I created a list of questions to ask. At the top of the list was, “Will this surgery really get me back on the road or will it set me back more?” Other questions included, “Can I do a half marathon without a medial meniscus (or with a torn one) and what can I realistically expect from surgery?” During the course of our chat, my surgeon noted two things after I told him of my epiphany the previous weekend: 1) “I was hoping this was the conclusion you would have come to at out last appointment;” and 2) “Better is the enemy of good.” Hmmm, another lightning bolt of wisdom from God’s mind (via my surgeon’s mouth) to my ears. He was SO cute in 1984! Why didn’t he stop while he was ahead? Dr. J expounded on that last statement by observing that he often sees people trying to make things that are good, or good “enough,” better, but far too often they fail to consider the consequences of their actions in the context of their body’s and technology’s limitations. Surgery doesn’t always improve things, it can simply make things a different kind of “not perfect”…like Michael Jackson! Point taken; surgery is on hold. Reconsideration at Thanksgiving. Rather like a child learning a tough lesson in delayed gratification, I have finally accepted, even embraced, that I can go much further than seven days, or even seven weeks, before feeling “better.” I can be okay with the wait; I can be patient in this “affliction,” and be productive, too. No need to just bide my time any longer. Unlike after the wreck, today I can appreciate the reality that surgery may or may not improve my knee. Truthfully, it could make things much worse. There are no guarantees either way. I lost sight of that for a while, but I’ve got it now. So, in the mean time I’m at the gym almost daily, pushing myself a little more at each session. Even if I’m wincing as I go, I’m dragging my muscles out of atrophy and into hypertrophy. And it’s O.K. I’ve even started trying to racewalk on the treadmill, and my knee is tolerating it well. In fact, I just printed off the Couch to 5K program. The long and the short of this post is it’s time to stop pouting and get myself back into form. Hopefully, my meniscus won’t be too much of a hindrance. But if it is, well…that’s a post for another day. Onward and upward, my friends! According to the site “The Spirit of Water,” the lotus flower symbolizes harmony, spiritual illumination and unlimited potential. 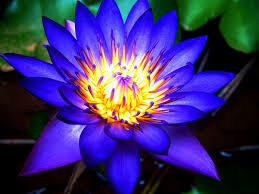 The lotus is a water lily which rises from the sludge of muddy waters. It reinforces the concept of resurrection. Use as a reminder that “this, too, shall pass.” It symbolizes forgiveness, gratitude and compassion and invites a balance between humility and pride.